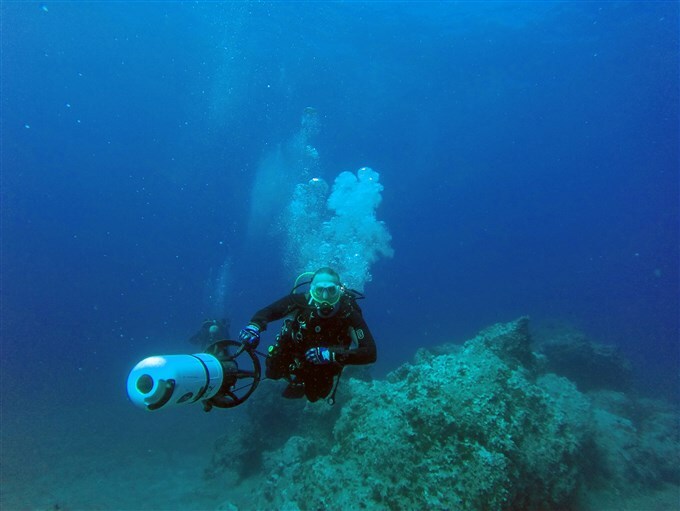 Home » Scuba diving news / articles » DIVING WITH UNDERWATER SCOOTERS DPV! As in every activity, the evolution of technology gives us opportunities to enjoy new experiences. In recreational diving a really cool thing to try is diving with DPV, also called underwater scooter. Thrilling sensations are guaranteed! What is a DPV and why is it so enjoyable to dive with it? 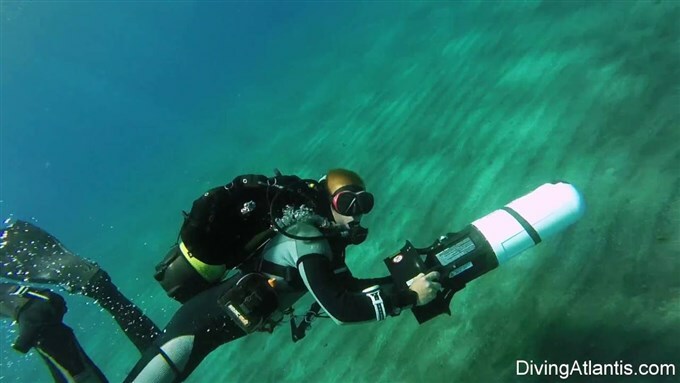 The Diver Propulsion Vehicle is a machine that contains an electric motor and a propeller. There are many kinds of DPV, the most common ones are very easy-to-use, they tow the diver who is holding a handle and wearing a harness connected to the scooter. It is like an underwater jet ski that allows the diver to go faster and travel greater distances in a short time. This is the reason why many divers love scooters. Scooters let you explore larger parts of dive sites that would be absolutely impossible when swimming normally. Moreover, you can go farther than the well-known sites in order to discover new beautiful secret underwater places. Many new dives sites have been found by divers using DPV. 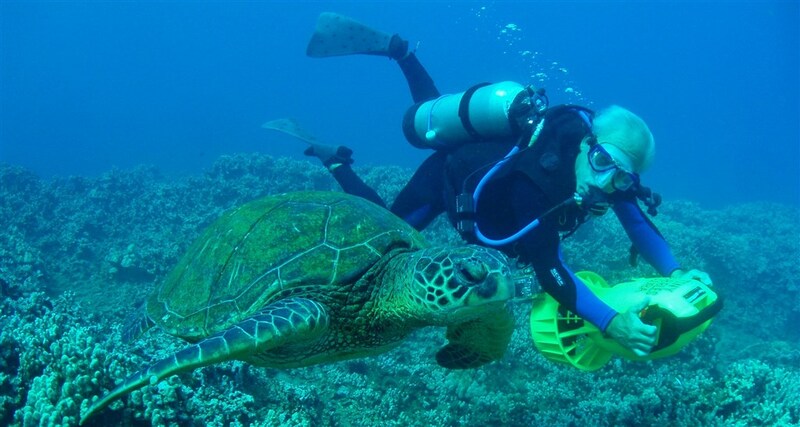 This kind of diving is also attractive for the divers who seek thrills because the feeling of moving fast underwater brings high level of adrenaline! Who can try diving with DPV? A few years ago only the technical divers were using the DPV to penetrate into caves deeper and farther than they would by using the fins. Nowadays the DPV have become widely available and any certified diver of at least 12 years old with Open Water license or equivalent can use an underwater scooter. Of course, you need to master the diving skills like buoyancy and to be able to enact the emergency procedures quickly. It means that it is better to use a DPV when you are feeling confident as a diver and have some experience in diving (we usually recommend to try it after you have at least 25 logged dives). How can you get started for this new adventure? There are different ways to start using DPV. One of them is to do a try dive with an instructor who will show you how to use it. This doesn’t give you any certification but you get an overview of the activity. Another one and more recommended is to follow a course in order to become a certified DPV diver. During the course you will get knowledge of the proper use of the scooter, its maintenance, planning of the dives and the adequate emergency procedures. After some theory and 2 amazing dives you get a certification which gives you the possibility to rent scooters anywhere in the world. Yeah....! It feels amazing to be Divemaster. 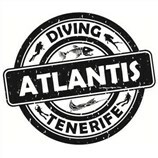 It's adventurous, and being a diver this is a great opportunity to learn about the sea world. I heard about it through my friends. Through the diving you feel positive vibes and lots of confidence. This course helps you to choose a good career option.